Vivo V11 Pro is the newest entrant in the midrange segment that offers a host of features. 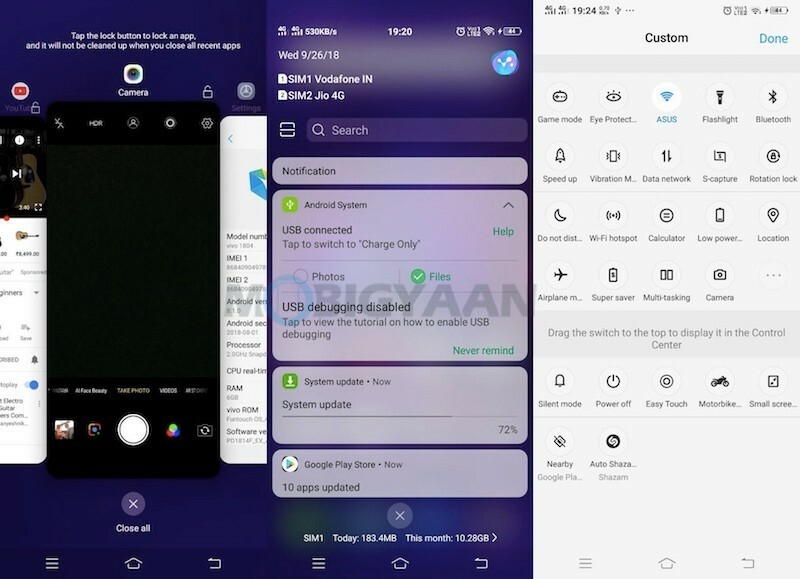 The company has been bringing innovations to the smartphone industry, we saw its high-end Vivo NEX with the popup selfie camera, the full notch-less screen, and an in-display fingerprint scanner which was first seen on the Vivo X21. Vivo V11 Pro is perhaps the midrange outcome of it featuring a waterdrop notch, in-display fingerprint scanner, Snapdragon 660, 25 MP selfie camera and much more. Here’s our Vivo V11 Pro review. 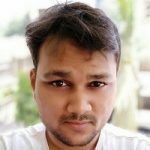 Here’s our Vivo V11 Pro unboxing and hands-on video in Hindi. The two of the most prominent features of the phone are the waterdrop notch and the in-display fingerprint scanner. The in-display fingerprint scanner is derived from the X21 and NEX and unlike what every smartphone is doing, the Vivo V11 Pro sets apart from a physical scanner and offers it under the display. 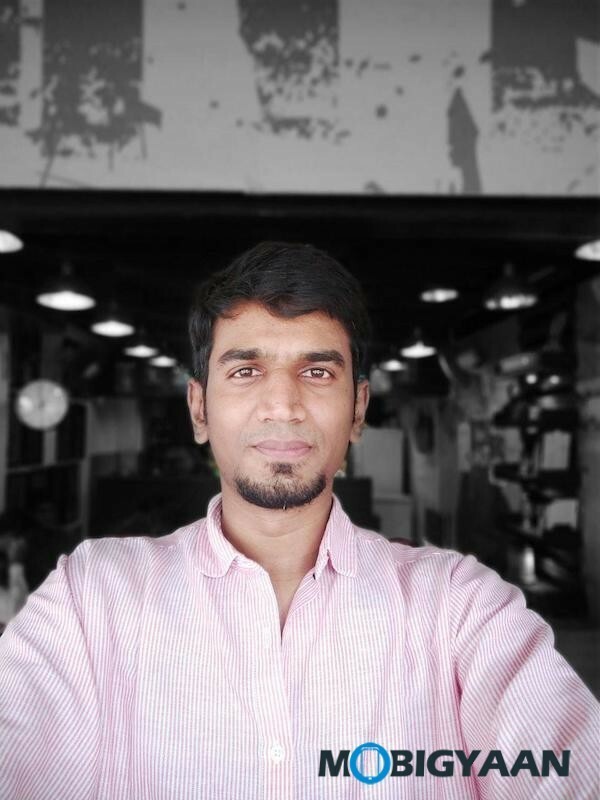 This is a unique feature of the phone which can be found on a handful of Vivo smartphones only. The Vivo V11 Pro offers a full-screen design, Vivo calls it a Halo Notch or you can say waterdrop notch. It offers a high screen-to-body ratio of over 91%, the bezels are extremely thin, the back has a glass-like body, the overall design is premium. The design also resembles the top-of-the-line NEX and the Starry Night Black color looks beautiful. Talking about the display, the Vivo uses a Super AMOLED panel sized at a whopping 6.41-inch with an aspect ratio of 19.5:9. Compared to the competition, Vivo V11 Pro emerges with a better display quality overall and at this price, the V11 Pro has one of the best displays out there. 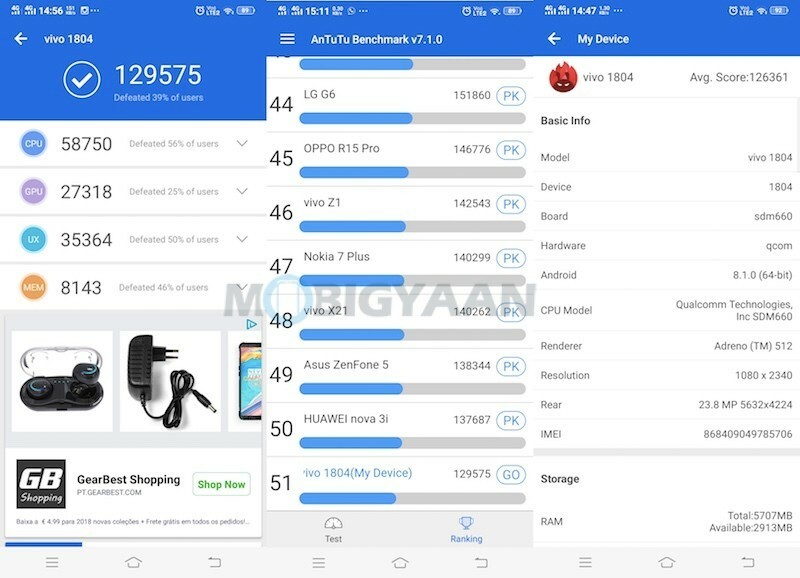 No, you don’t see a Type-C USB and this is where the Vivo V11 Pro fails to standout with the phones with newer USB standard like the Nokia 7 Plus, Xiaomi Mi A2 as well as the Honor Play. The only Vivo phone we saw that offers a USB Type-C port is the top-of-the-line Vivo NEX. You get a 3.5 mm audio jack alongside loudspeakers and a microphone at the bottom. The second microphone is available at the top. The right comes with the usual power and volume keys and the left side offers a SIM tray that carries a separate microSD card slot. You don’t get much options in the display settings, you can enable the eye protection, color temperature, and the third party aspect ratio for waterdrop notch compatibility. 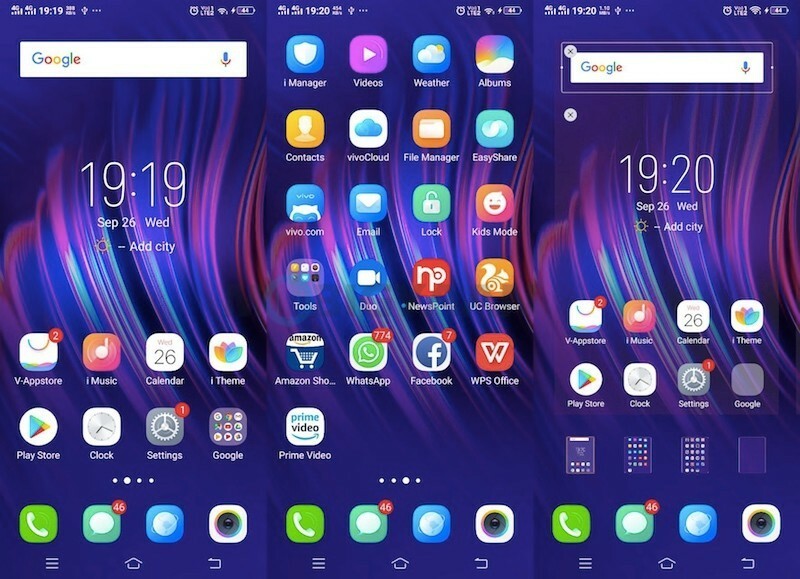 On the software side, things haven’t changed a lot, the Vivo V11 Pro runs on the same Android 8.1 Oreo operating system with an updated interface FunTouch OS 4.5 that adds a few features to the operating system. 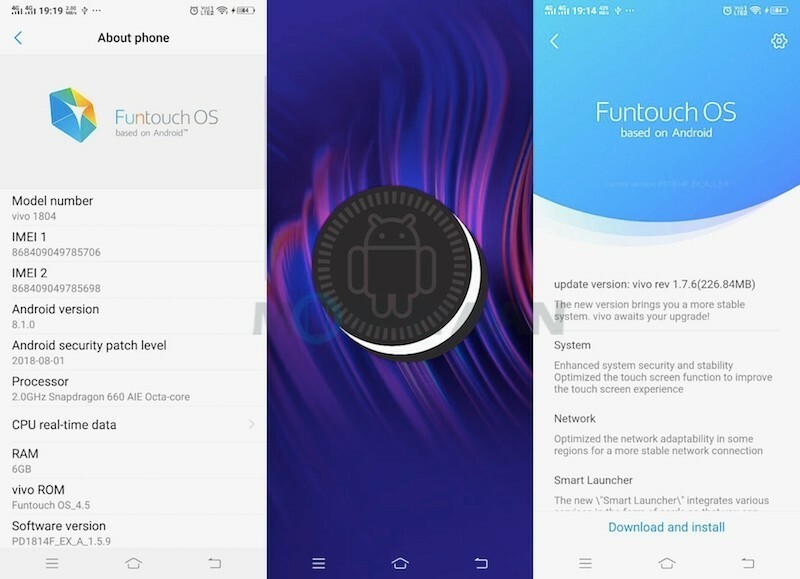 The FunTouch OS 4.5 is based on the same Android 8.1 Oreo we saw on the past Vivo phones but mainly features a Jovi assistant and the Google Lens integration in the camera. 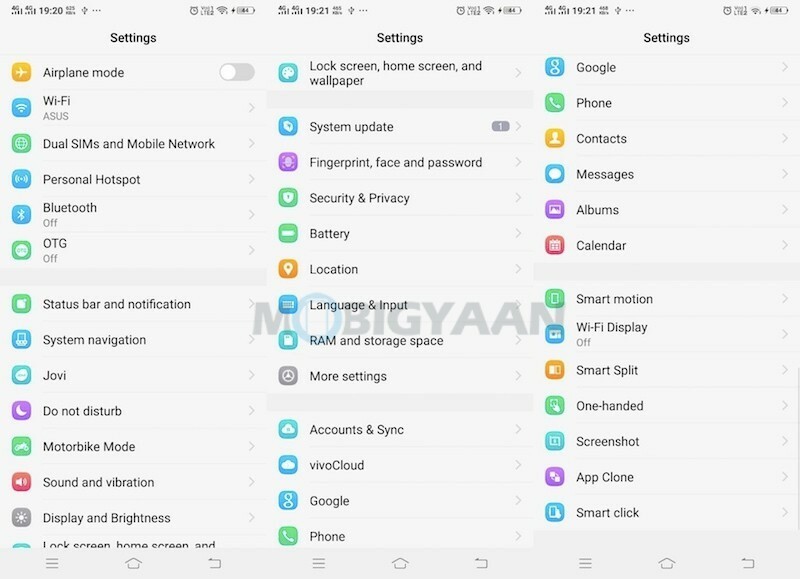 The software is also optimized for the new waterdrop notch screen and AI camera upgrades. 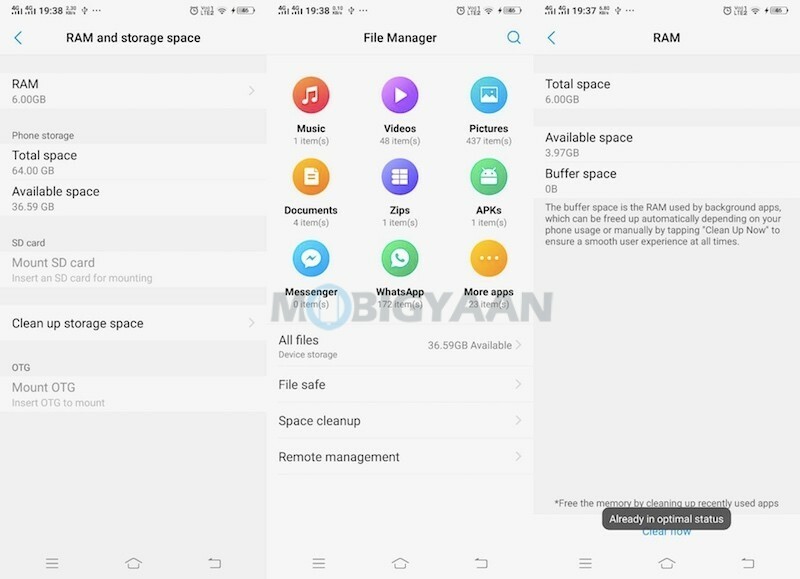 Even though you have a chunk of bloatware in the software, but offers clutter-free user experience. You can remove or disable the apps if you don’t. It’s nothing new for many, Vivo has bloat on every other device. 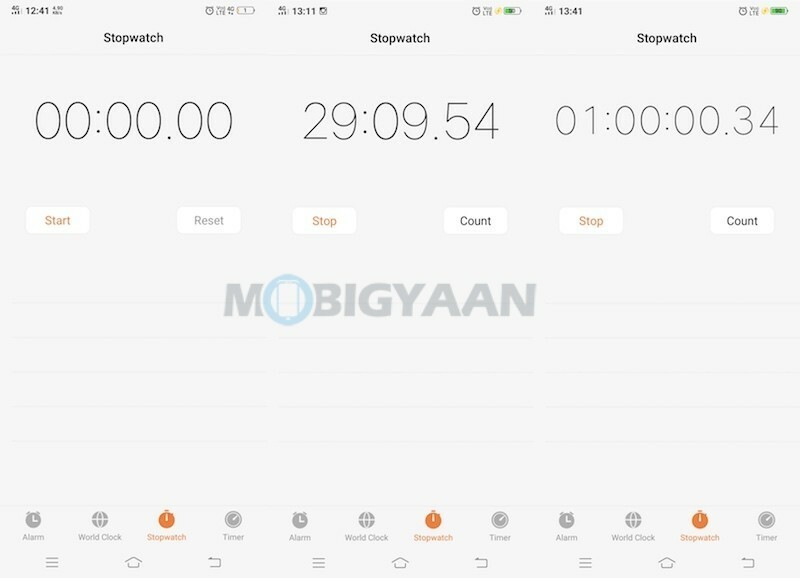 More features include the gesture-based navigation, Face Unlock, Motorbike mode, Small screen, Auto Shazam, App Clone, Smart click, Smart Split, Easy touch, and a few more. The fingerprint scanner isn’t that fast, not as fast as the physical ones found several phones, however, talking about the face unlock, it’s super fast. Yes, trust me, it’s fast and scans the face even in the dark. I mostly unlock the phone with the face, the use of the fingerprint scanner is less. If you want a faster fingerprint scanner, you should stick to the physical scanners. Vivo has significantly upgraded the internals on the V11 Pro, the predecessor V9 offers a Qualcomm Snapdragon 626 SoC while V11 Pro packs a Qualcomm Snapdragon 660 SoC. Spec-wise, the Vivo V11 Pro is very much the same as the Vivo X21 which was launched a few months ago. 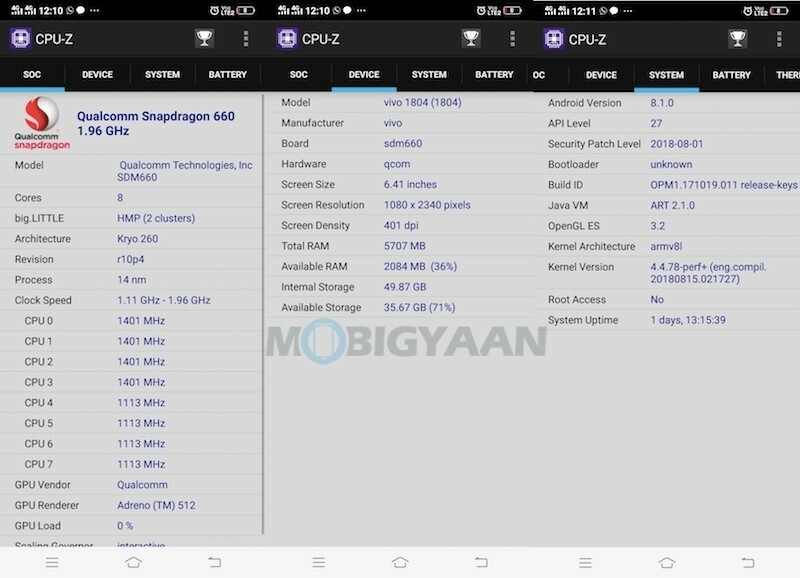 The Snapdragon 660 is an octa-core SoC clocked at 2.2 GHz max and is further paired with 6 GB LPDDR4 RAM. Rivals on the other side pack the same chip, the Nokia 7 Plus and the Xiaomi Mi A2 offers similar performance and are priced at Rs 25,999 and Rs 16,999 respectively. 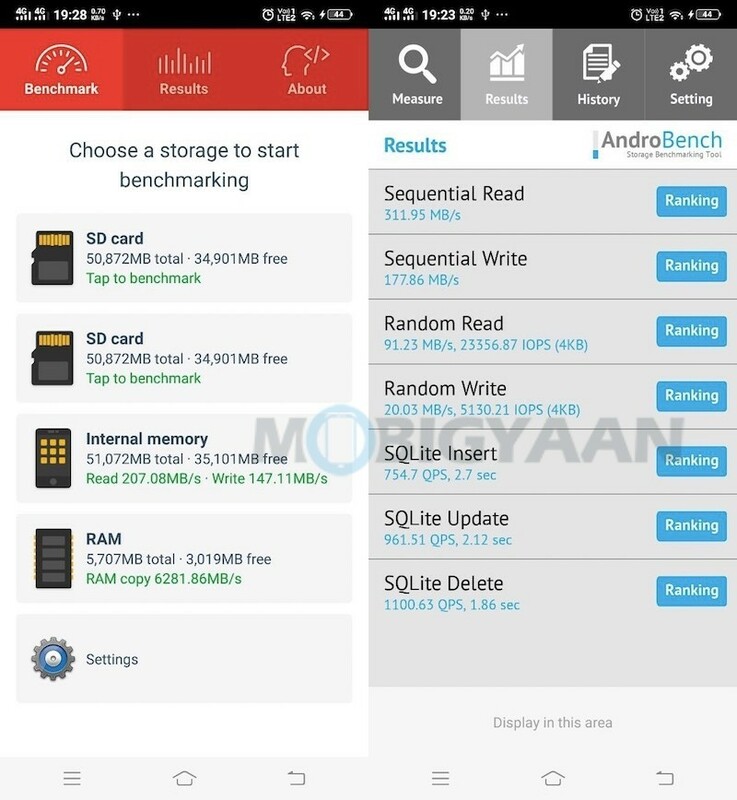 Our benchmark tests performed on the Vivo V11 Pro scored 129,575 points in AnTuTu, and 1,444 points (single-core CPU), 5,436 points (multi-core CPU), 5,278 points (GPU) in Geekbench benchmarks. 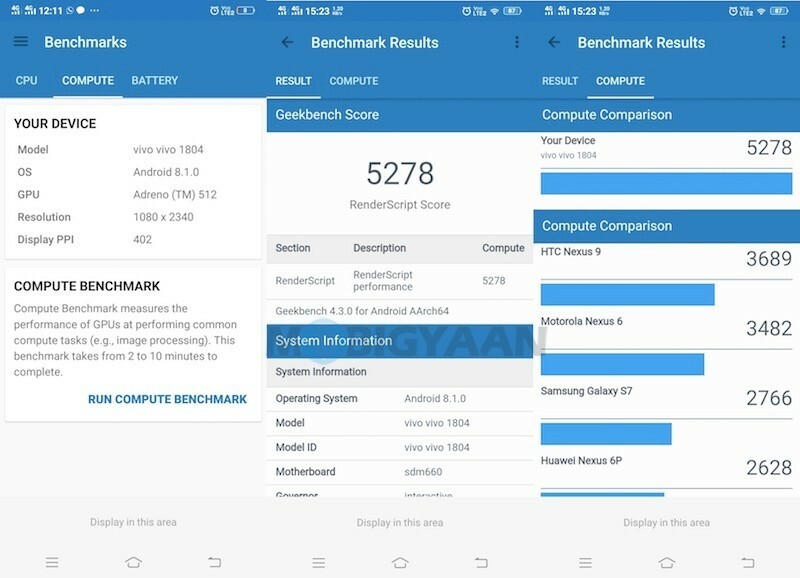 Gamers are likely going to enjoy the performance of the games, the Adreno 512 GPU on the Vivo V11 Pro is faster than the Adreno 506 found on the Vivo V9. Heating is not an issue with the phone, the phone runs cool. 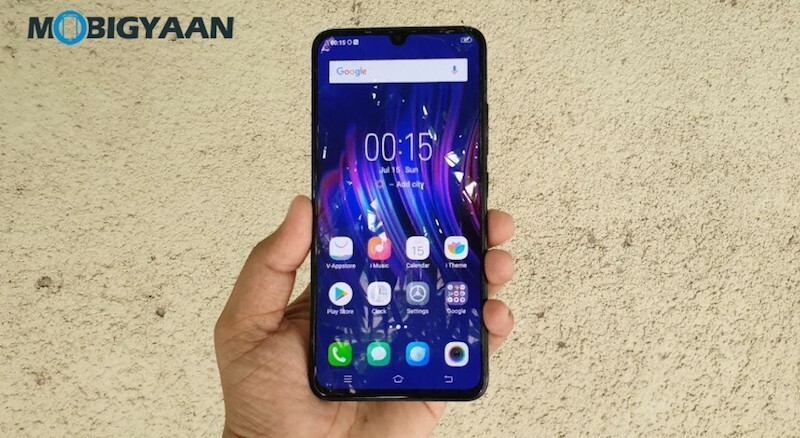 The Vivo V11 Pro comes in only one variant i.e. 64 GB with support for microSD card up to 256 GB. The performance of storage is fast, not as fast as the phones UFS storage. If you want better storage and RAM performance, go with the POCO F1 with the Snapdragon 845, it’s also cheaper than the Vivo V11 Pro. 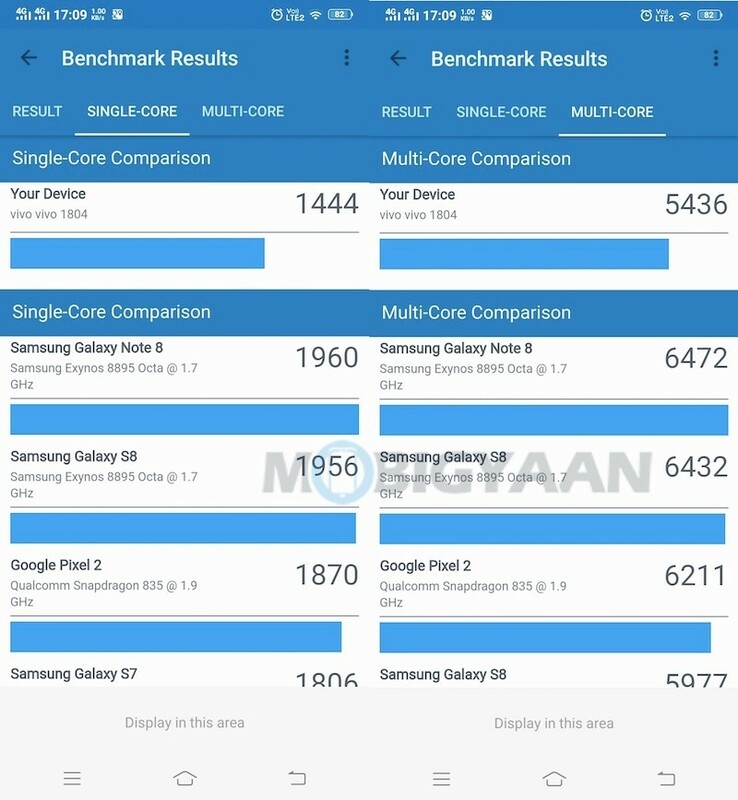 Check out the benchmarks we have shared below. 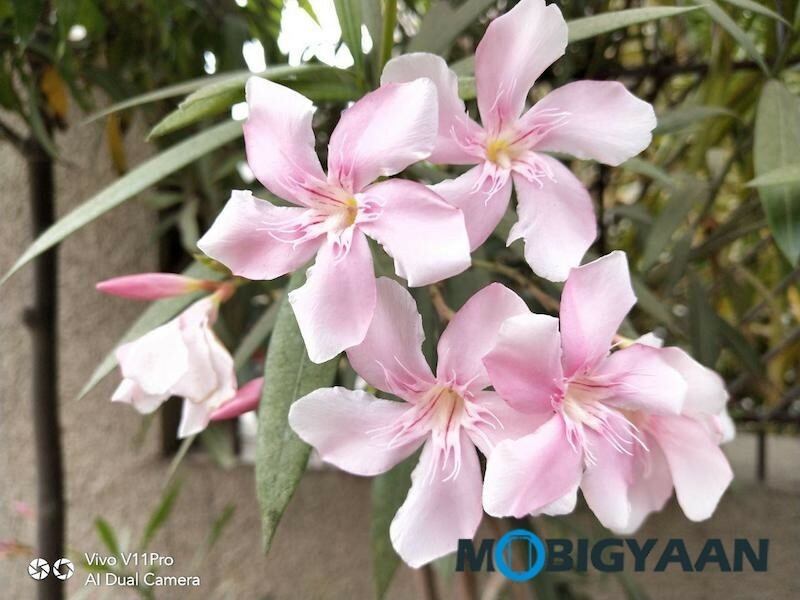 On the camera front, the Vivo V11 Pro has similar camera setup found on the Vivo X21. The rear side has 12 MP (f/1.8) + 5 MP (f/2.4) Dual Pixel cameras with AI features. The AI camera offers AI Backlight HDR, AI Low Light Mode, AI Scene Recognition, and AI Portrait Framing aided by a single LED flash. The selfie camera offers a 25 MP sensor with f/2.0 aperture and AI features including Face Shaping and AI Selfie Lighting. 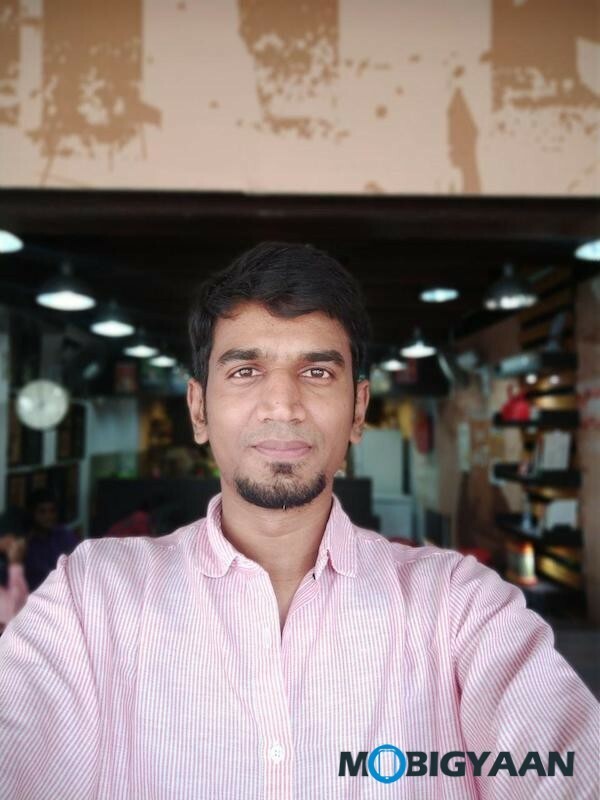 About the camera features, the features are similar to the Vivo V9 camera. The camera also includes the AR Stickers feature that adds effects to your face and you get the Lightning effects which add different lighting modes like adding light to the face or removing the colors in the background while retaining the colors of your face and body. 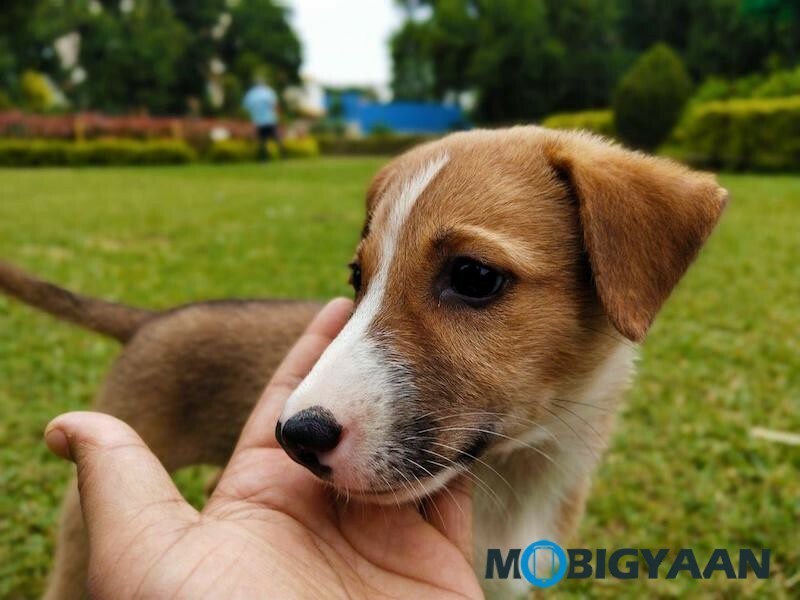 The dual cameras can snap the pictures with bokeh effects and uses AI which enhances the image. The shots are detailed, color and contrast are well balanced, and the overall quality is simply great. 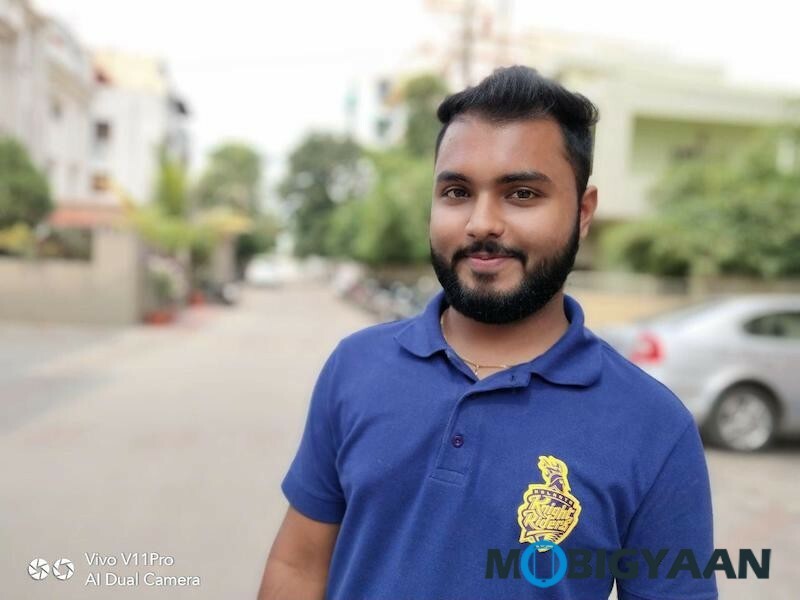 If you are taking portraits, the Vivo V11 Pro is one of the best phones in this price. 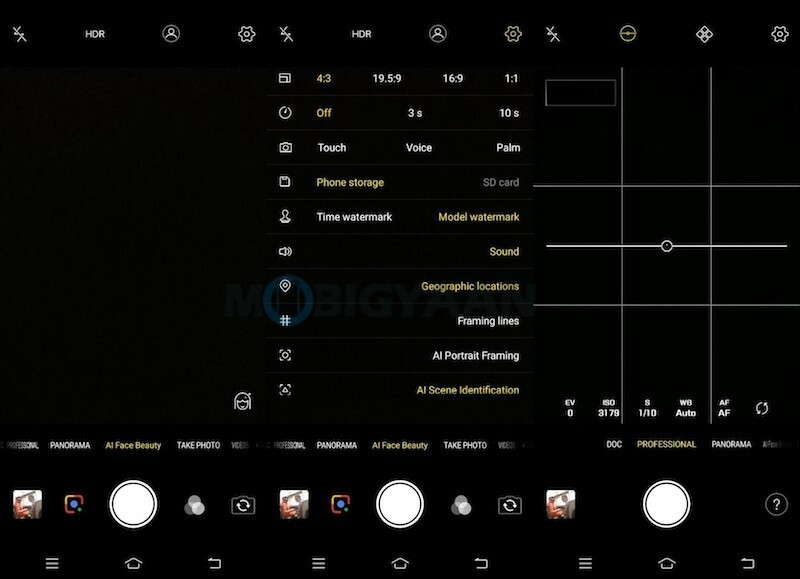 The dual cameras do not support OIS and EIS which may not tempt certain users who are camera-centric. Adding Rs 4,000 in your budget will get you ASUS ZenFone 5Z with OIS-enabled dual cameras. 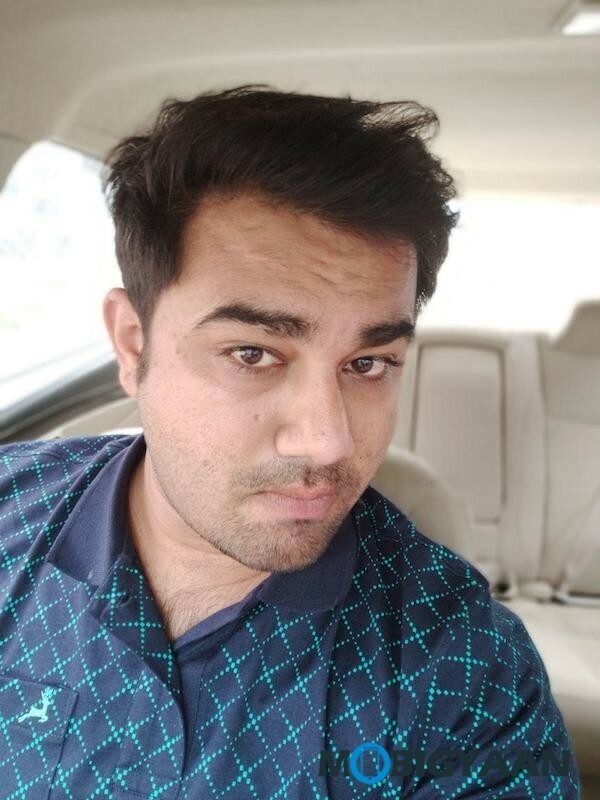 Vivo V11 Pro camera can shoot up to 4K videos at 30fps which isn’t bad. The 25 MP selfie camera snaps crisp and clear images, you get very detailed selfies in the daylight. 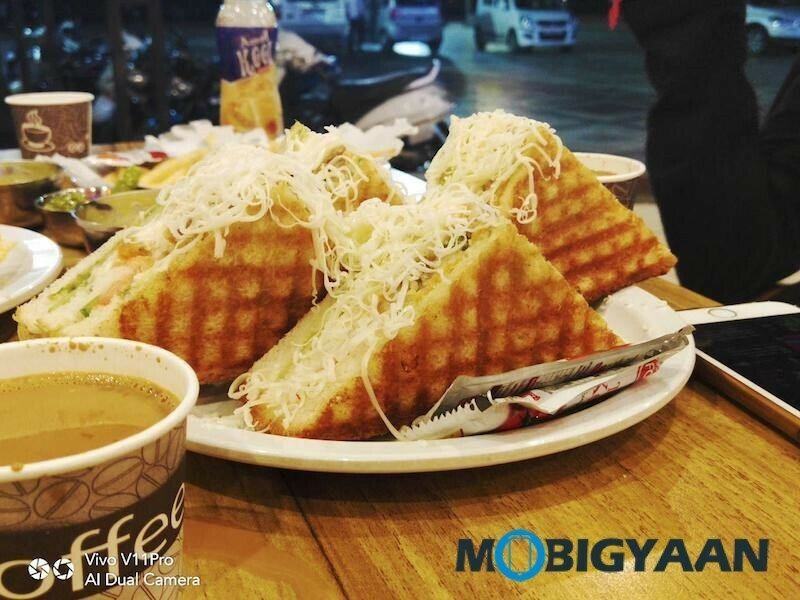 Although you don’t get a dedicated flash on the selfie camera, the screen flash should do the job while taking low-light selfies. 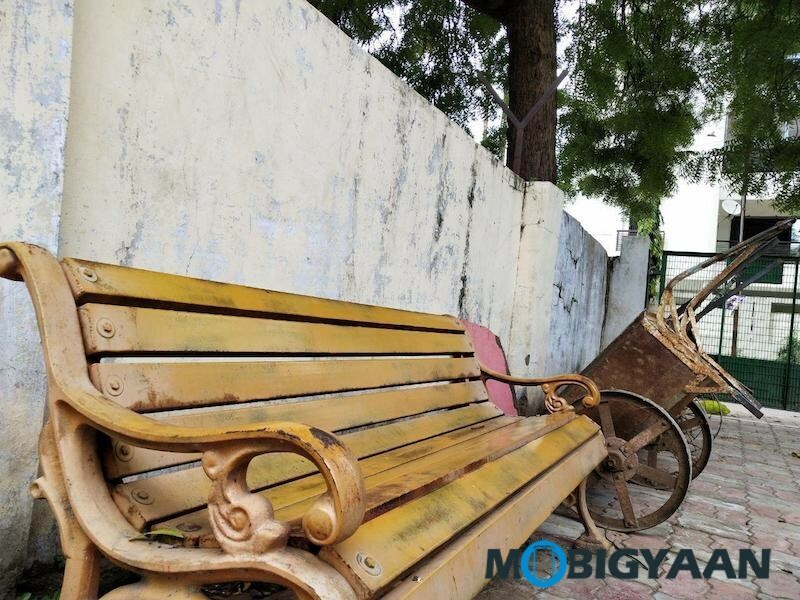 Here are some shots that we took on the Vivo V11 Pro. The Vivo V11 Pro packs a large 3,400 mAh battery with fast charging support. 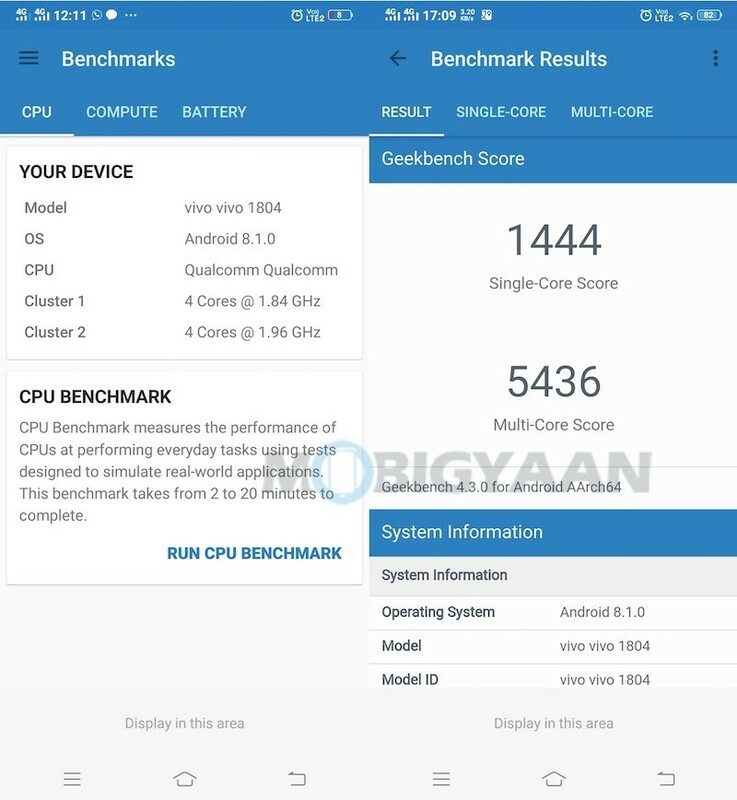 No wonder the battery life on most Vivo phones isn’t surprising, the FunTouch OS 4.5 seems optimized for the phone. The 3,400 mAh certainly lasts up to 1.5 days on average use which is pretty much decent and you have the fast charging support for it. 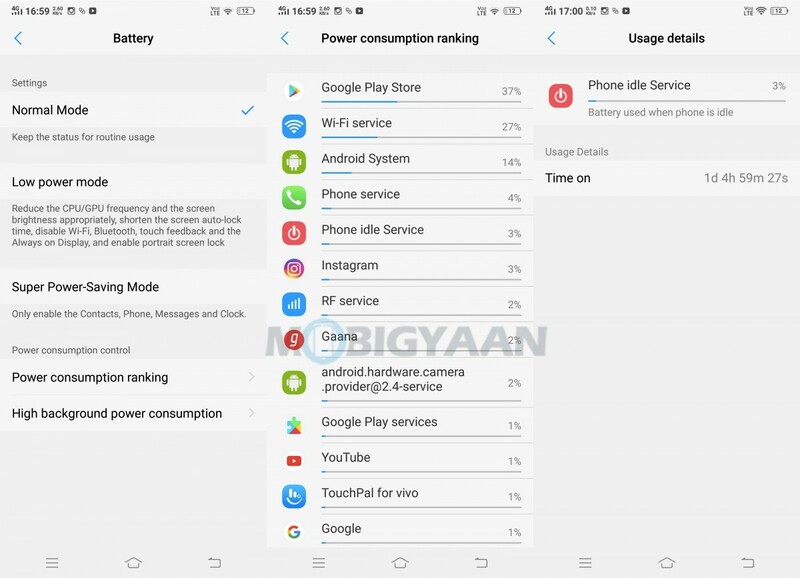 For the battery charging, the Vivo V11 Pro offers Dual Engine Quick Charge that charges the phone in about 80 minutes from 0% to 100%. Vivo has added a parallel connection between the two charging chips along with nine different safeguards for safe charging. This is one of the fastest charging phones to my knowledge and competes the OnePlus’ Dash charge. Vivo has been offering top-notch features for a decent price which makes the phone a worthy contender. Compared to the predecessor Vivo V9, the overall specs and features are surely worth to consider. You get a high-quality AMOLED screen, an almost notch-less design, an on-screen fingerprint scanner that no other phone offers in this segment. The performance is surely better if you are moving from the Vivo V7 or the Vivo V9. If you want high-end performance on the phone, want to play heavy games, choices are the POCO F1 and the Honor Play.